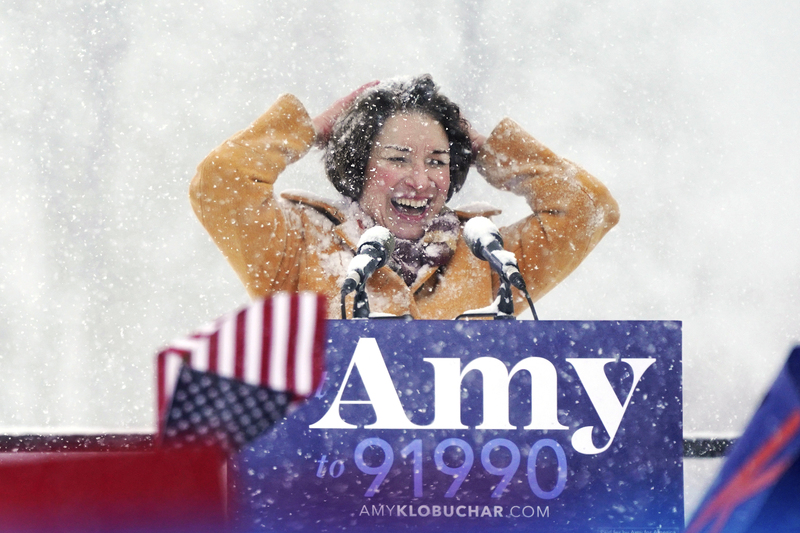 Last weekend, two more candidates joined the list of Democrats jostling to be president: Massachusetts Senator Elizabeth Warren and Minnesota Senator Amy Klobuchar. Warren quickly fired back: “By the time we get to 2020, Donald Trump may not even be president. In fact, he may not even be a free person.” Her comments referenced investigations surrounding the president. The list of Democrats already in the race features several well-known senators—Kamala Harris of California, Cory Booker of New Jersey, and Kirsten Gillibrand of New York. Some believe the field could soon expand to include former Vice President Joe Biden and Vermont Senator Bernie Sanders. With the Democratic National Convention still over 17 months away, these candidates are in for a marathon race to the presidential finish line. Giving a statement on global warming in a snow storm is pretty funny and coincidental. You think God is trying to tell us something? I think Bernie Sanders is Independent. No. There is a difference between weather and climate. Why is it crazy that nine democrats will be running? The more people running for president the better. It is this kind of attitude and ignorance that will lead to problems later. I hope nobody seriously thinks "It's cold outside" is anything more than a joke of an argument against global warming. I was thinking the same thing, lol. I HOPE TRUMP WINS THE ELECTION. HE IS THE BEST PRESIDENT EVER!!!!!!!! Democrats. Enough Said. O. Cortez, enough said. While I think the joke about global warming is really funny...Zack's right, it's not a good argument against global warming. I don't believe in global warming, but you can't just look outside your window to check if it's really happening. It's much more complicated than the weather in just one, or even several, locations. I also agree with Zack that the more people running the better. Although at this point I'm hoping President Trump will get in again, it's great to have a bunch of other candidates--it makes for some good competition and a wide variety to choose from. Think about it this way, do you think humans can ruin the Earth? No. Only the one who created it can ruin it. That 's all I am going to say. Yes, humans can't destroy the world at the moment, but we could certainly eradicate all human life. We shouldn't say "oh don't worry, God will save us." Because we are the instruments for Gods work. There have been threats to humanity in the past, and the solution was never to "let God save us" the solution was to take action and let God work through us. He's right up there with them Sarah, just look at the numbers. If Trump wins in 2020 can he run again in 2028? No, if he gets reelected, then he will have served two terms, which is the most a person can be president. Actually F.D.R. served for more than 2 terms. President Roosevelt served for three and part of a fourth term, but shortly after his death Congress passed a constitutional amendment (the 22nd amendment) that says you can only be elected as president twice. I hope Trump wins the 2020 election!!! I read your comment on President bonald j trump its afishal and I completely argry with you. And with your comment on this artticul. Defently the ones on this articul. @Zack w I don't want to get into this agen. I watched her in my living room. I watched her on TV. in 2020. Just so you know. It wasn't me. It would be nice to have a female president.but not a 20 year old SOSHALIST!!!!!!!!! Just because you don't follow all of these doesn't make you a bad christian, because some things that were important at the time of the new testament (like the verses about women you mentioned) Are no longer important now. Chuck Norris would be president, but Chuck Norris never runs. If global warming was real, then why are we having record colds in Michigan??? I think that women should respect men, but men should also respect women. That vers is speaking about church at that time, the women sat on one side and the men on the other so if a woman wanted to say something to her husband then she had to yell over the minister to be heard. Paul was speaking to the women who yelld durning the service. Telling them not to yell and to wate to be heard. Oops I ges I didn't read your who's comment sorry. I didn't mean to judge you. I completely angry with you. Its frezing here in Indiana. But we all have our own opinions.